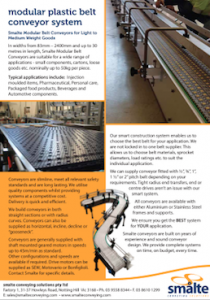 As a very robust conveying option, Smalte Conveying Solutions’ Modular Belt Conveyors are suitable for a wide range of applications – small components, cartons, food products, loose goods and more. Ask us about our range of custom spiral conveyor solutions to suit your needs. Please Note: The above options depend upon what is best for your application. We endeavor to provide the best custom solutions for your needs and plant size.